Poorly fitting gloves reduce dexterity and tactile sensitivity, resulting in a need to use stronger muscle force. Companies can experience major costs and significant productivity losses due to injuries related to glove use. Poorly fitting gloves can also be a food safety hazard. Implementation of new gloving policy and products to match workers needs often results in improved safety productivity, job satisfaction and morale. Read more on about this in The Top 6 Hazards of Disposable Gloves. * If you are in-between sizes, select the bigger size option. Each chemical requires a different type of glove protection for the wearer. Conditions, exposure times, chemical concentrations and residues may effect glove performance. It is strongly advised that on-site testing of all gloves is important to determine safe usages. 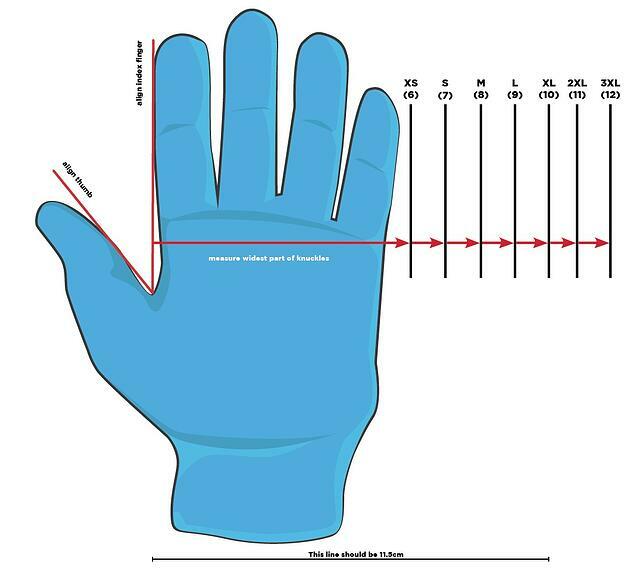 The cuff length of a standard glove, 240mm, covers only a small area of the wrist. If lower arm protection is required, extra cuff length is needed, such as our 300mm Blue Diamond Textured nitrile gloves. The role that the glove will serve will also determine which glove you will require. For example, a textured surface glove provides a more secure grip in wetter conditions. Those who have latex allergies or skin sensitivies will need a latex-free nitrile option such as our Sensitive Powder-free Nitrile gloves. These types of gloves do not contain accelerator chemicals normally used in the manufacturing process of nitrile gloves that can cause skin irritation. Cheaper gloves can be manufactured from cheap, low-quality raw materials, and subsequently have a higher failure rate. If you are experienceing ripping or breakage problems - moving to a thicker glove is not necessarily the best option, and increases cost and waste. Read more about Why Cheap Disposable Gloves Don't Save You Money. Now that you've selected the right glove size. Use our glove comparison chart to help decide which glove type is right for you. Not sure? Let our glove experts help.